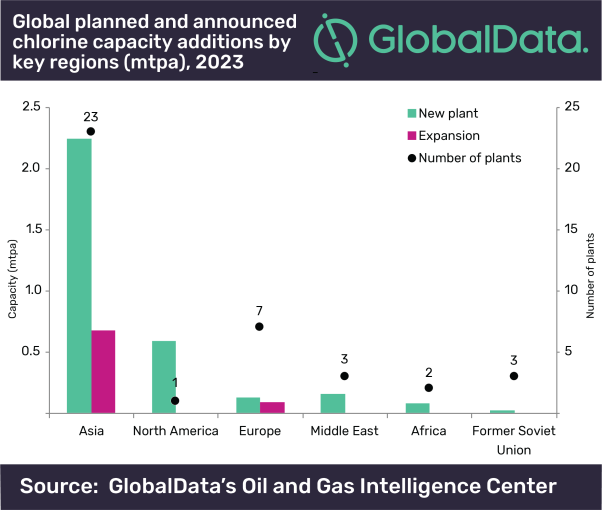 Global chlorine capacity is poised to see considerable growth over the next five years, potentially increasing from 83.03 million tonnes per annum (mtpa) in 2018 to 87.04 mtpa in 2023, registering a total growth of 5%, says GlobalData, a leading data and analytics company. Chlorine capacity in Asia is expected to increase from 48.35 mtpa in 2018 to 51.29 mtpa in 2023, at an average annual growth rate (AAGR) of 1.2%. Among the countries in the region, China will add capacity of around 1.34 mtpa by 2023. Major capacity addition will be from the plants, Xinjiang Zhongtai Chemical Company Urumqi Chlorine Plant and Hubei Yihua Chemical Industry Xinjiang Chlorine Plant, with a capacity of 0.98 mtpa and 0.89 mtpa, respectively by 2023.